In a world where only the bold and loud ones seem to get all the attention, Dr Neal Bermas is the best example that humble and quiet strength can go a long way. The founder of the non-profit social enterprise STREETS International accomplishes on a daily basis what most of us hope to achieve in a lifetime: to leave a footprint. To change the world for the better. To make a difference in people’s lives. STREETS International provides the opportunity for disadvantaged youths to transition from poverty to successful careers. STREETS International provides the opportunity for orphaned, disadvantaged and trafficked youths to transition from poverty, lack of prospects and living on the streets to successful careers in the hospitality industry of Vietnam and beyond. Dr Bermas and his STREETS team developed a comprehensive 18-month program in culinary and hospitality training, including life skills, English classes, housing, meals, clothing and medical care. 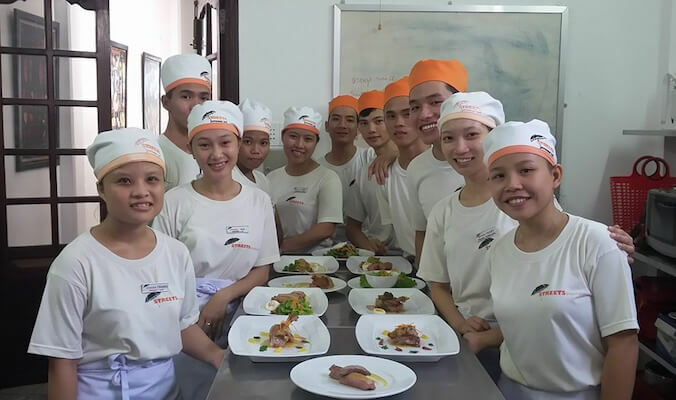 Trainees gain their knowledge in the classroom and refine their skills apprenticing in the organization’s restaurant, STREETS Restaurant Cafe, which is constantly ranked in the top Hoi An restaurants by TripAdvisor. Due to the amazing success of the program – 100% of the graduates secure starting careers at 5-star resorts and hotels after their completion – STREETS is about to expand to Ho Chi Minh City, to open another comprehensive program and apprentice restaurant to save more young men and women from a life in poverty. To accelerate the process, STREETS hosts a charity event on December 1st at Park Hyatt Saigon to raise money for the project. Celebrity chefs, international media and a lot of companies, amongst them Soneva Kiri, a member of Healing Hotels of the World, Ernst & Young, HSC Bank, CVC Capital and Cathy Pacific, will come together to support the good cause. This program doesn’t aim to change lives, it actually changes them. All of the supporters understand that this program doesn’t AIM to change lives for the better, it actually CHANGES them. Every day. Every kid. A young man for example, son to a poor fisherman, was sold to work in a locked and toxic factory. His parents were duped with the promise of job training and proper work for their son, who barely survived the conditions. He was eventually rescued by an NGO that works closely with STREETS and accepted to the program. After graduating he started a career as a server in an international hotel, before he was recruited for a supervisory position at a top hotel in Singapore in 2016. A long way from the unimaginable slave labor of just a few years ago. Another young man lost his parents at an early age to the HI virus and suddenly found himself responsible for his two younger brothers. Shunned by a poor and uneducated community that feared the unknown they were left fending for themselves on a daily basis. The young man dropped out of school at 8th grade in order to make a daily living of washing cars at a local café or parking motor scooters. When he heard about STREETS he recognized the life-changing opportunity at a glance. After graduation he is now a Commis Chef at the International Pullman Resort, earning enough money to also provide education and a future for his siblings. Living on the streets and being poor is even tougher and more dangerous for girls. At the age of 15, another STREETS graduate was abandoned by her father after her mother’s death. Along with her sister she found simple housing at distant relatives with no resources to continue an education. STREETS offered not only food, shelter, education but also a bright future. After graduating, this girl’s strong command of English and her top-level hospitality skills did not go unnoticed and she was offered a position with Hyatt Hotels. In 2015 she was named ‘Employee of the Year’ at the Hyatt Regency and promoted to ‘Team Leader’, a supervisory position, shortly after. If you happen to be in Ho Chi Minh City with a big appetite and a big heart, on the 1st of December 2016, purchase a ticket to the charity event at Park Hyatt Saigon, featuring ten delicious tasting stations and award-winning chefs. Read the up close and personal interview about Dr. Bermas’ motivation and inspiration behind this project or visit STREETS International for more information or to donate, in order to support this extraordinary organization where your money actually makes a profound change, giving disadvantaged youth a second chance. STREETS VIDEOS – Learn even more about STREETS International by watching these short documentaries about the program in Hoi An, Vietnam.